Tom Szaky talks 19 to the dozen. It's as if he doesn't want to waste a single minute of the hour-long interview I have with him. "It's a lofty ideal I know," he says, but so far so good. The company's business model is to find waste and turn it into something useful, for a profit. It collects things that are generally considered difficult to recycle - such as cigarette stubs, coffee capsules, or biscuit wrappers - and finds a way to reuse them. It relies on contracts with businesses - such as McVities, Johnson & Johnson, and Kenco - that pay TerraCycle to take away their waste, as well as individual consumers collecting and sending it in, in return for donations to a charity of their choice. With messy hair, jeans and sweatshirt, Tom, 33, is typical of the new breed of young entrepreneur that shuns formality. Yet he goes one stage further - he's worn the same pair of jeans every day for the past year (except for the weekend when they're washed) as part of his attempt to consume less. "In Hungary back then, you needed a licence for a TV set," he explains. You couldn't just go and buy one. Instead, after applying for a licence maybe a year later you'd get a black and white TV, and you'd get the one state channel. Tom says: "Only a few years later we end up in Canada where every Friday my dad and I would drive round and see mountains of TVs thrown out of every apartment buildings. "We'd pick a few up just for fun - because we thought 'who would throw out a TV?' and they all worked and they were colour!" TerraCycle was set up in 2002 after Tom, then 19, dropped out of Princeton University in New Jersey to develop an idea he had - much to the chagrin of his parents, who strongly believed in the importance of his education. "Yeah, [it was] one of those moments where the child tells the parents this is my life, and I shall do as I wish. A breakthrough moment in that sense," he acknowledges. The first product that TerraCycle made was an organic fertiliser created from "worm poop". Within five years, the firm had sales of around $3m to $4m, but was making a loss. It was then that Tom realised that the approach was wrong. "We were trying to come up with a product and then find the best type of garbage to make it. "Five years into the business we totally pivoted everything," he says. "Instead of starting the question with the product, we said let's start with the garbage… we need to solve crisp bags, cigarette butts and so on." Without that realisation, he reckons TerraCycle could never have been profitable. And he's a firm believer in profit. "Many young entrepreneurs think you can either do good for the world and earn nothing, or you can do something negative and earns loads of money. "I don't choose either - I want to make a lot of money by doing good. "People are also motivated by personal return. If I sell this company I'll make millions, and that's a human motivator. "I really fundamentally want to live my life in this way, but the fact that I can walk away with tens of millions - that's a positive, I'm not going to say I feel bad about it. " And everything about the business is fully transparent, he says, so every employee receives the same reports that he receives on the company's progress. The offices are open-plan, and are usually based in cheaper parts of town - the US one is based in Trenton, New Jersey, and the UK one in Perivale, west London. As part of the company's creative drive, it even has its own reality TV show - an excerpt of which shows the producer asking Tom if he could "stop talking in soundbites". He's nothing if not good at PR. 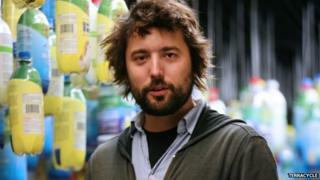 Of the challenges ahead for TerraCycle, he says a main one is keeping the large companies engaged. "It's about organisations maintaining their desire around these [TerraCycle recycling] programmes, because everyone wants the next new thing," says Tom. As for the individual consumers that send in stuff to recycle, he points out that they get nothing tangible in return for their service. "You're buying a good feeling - so that's a harder product service to sell. There's a lack of physical payback. It's not like buying a coffee or knapsack. We're selling something esoteric." Esoteric it may be, but investors are interested - Tom is in talks to sell a 20% stake with an unnamed British company for around $20m.